Our English camp is perfect for campers who will be staring school in August, coming to Houston for a visit, or for campers working on improving their English language skills. Our camps offers campers the opportunity of learning a second language in a fun and supportive environment with native speakers who will help them reach their goals. Campers will learn grammar, vocabulary, role-playing, and more. 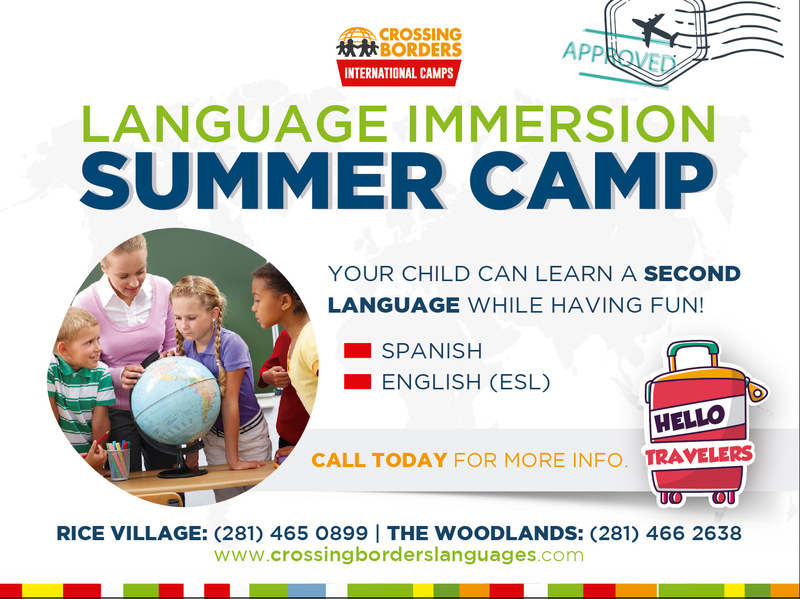 Crossing Borders offers a wonderful Spanish camp for campers looking to improve their skills or those wanting to learn Spanish for an upcoming vacation, school, etc. Our native speaking teachers will allow our campers the opportunity of expressing themselves in a nurturing and inclusive environment. The level of fluency for those enrolling does not matter. Our teachers are here to help campers achieve their goals and become bilingual! Our French camps is only available during the month of July and provides campers a unique language immersion experience. Our French camp is only for beginner students ages 8-14 and will encourage all campers to participate and express themselves in class. Our native teachers’ is here to help your child learn French though an encouraging and inclusive language immersion experience. We offer our language camp for anyone willing to learn a new language. Many campers come enroll without having language-learning experience. Spanish Camp Ages: 6 – 15 years old. Call (281) 466-2638 now spaces are filling up!